Review: Funny, cool, and fun, these are all words that describe Diary of a Wimpy Kid Dog Days, by Jeff Kinney. 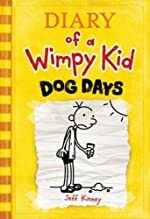 Diary of a Wimpy Kid Dog Days is the fourth book in the series. In all I loved this book; it was funny, interesting, enjoyable, and crazy! I liked it because it was funny. I also liked the fact that it was realistic, and it could happen to anyone. I liked that it was never totally unbelievable. Also, when Greg gets scared of the furniture at a sleep over. It was funny because his pants fell down at school. It was also funny when he is scared when he watches a horror movie, and he can’t sleep! Also, I found the book to be a fun to read. I would take away the pictures because it does not have words. I would like it to have more words because I like words! I would recommend this for grades second and anywhere up! I would rate this 4 of five stars. The other books in the series are: Diary of a Wimpy Kid, Diary of a Wimpy Kid: Rodrick Rules, and Diary of a Wimpy Kid: The Last Straw. Review written by JP (2th grade student). We would like to thank JP for providing a copy of Diary of a Wimpy Kid: Dog Days for this review. Have you read Diary of a Wimpy Kid: Dog Days? How would you rate it?